The QBrand QBlog: Forbidden planet: Who makes Planet Ark washing powder? 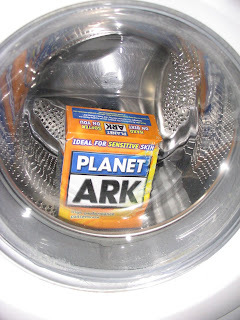 Forbidden planet: Who makes Planet Ark washing powder? In consumer marketing, green is the new black. It’s no secret that all manner of business and brands not previously known for their "earth-friendliness" are adding a splash of green here and there, and mostly to good effect. Planet Ark, a green brand that first came to consumer attention more than a decade ago by promoting recycling initiatives, has come a long way from those humble beginnings. Planet Ark is now an impressive consumer brand with high levels of recognition, approval and trust. From a commercial perspective, this means the organisation is ideally placed to capitalise on the current surge of consumer interest in all things green, water-saving and climate-friendly. While early moves in this direction saw Planet Ark as merely an endorser of products like Safe brand toilet paper and Aware laundry powder, the Planet Ark brand has recently assumed centre stage as a consumer product brand in its own right. My household recently ditched an established national brand in favour of Planet Ark washing powder, and we are pleased with its performance so far. The rather simple and stark orange and blue box is awash with all kinds of information about the product, its ingredients and its environmental and health credentials. Strangely, though, amidst all the detail about cellulose colloids and plant oil surfactants, there’s no indication of where the product is made, or by whom. Oh, sure, there’s an address – Planet Ark Environmental Products Pty Ltd, based in the Blue Mountains town of Wentworth Falls – but the Planet Ark website lists only eight staff in the Wentworth Falls office. There’s no mention anywhere of the kind of manufacturing and packaging operations required to produce mass-market quantities of a consumer product, nor whether these operations are undertaken in Australia or elsewhere. Neither is there any reference in the Planet Ark organisational structure to supply chain management – the process of sourcing all these non-petrochemical ingredients – nor a logistics and distribution network large enough to supply national supermarket chains. The extensive FAQs section of the Planet Ark laundry powder website also sheds no light on the issue of who makes it. The nearest it comes is a question that asks Are the products Australian Made & Owned?, to which the answer is Yes they are. Some of the raw materials are not made in Australia so they must be sourced from overseas. It’s hard to understand why Planet Ark seems so coy about identifying its commercial partners in what looks to be a good product with commendable credentials, especially as it has proclaimed itself "pro-business" from the outset and been transparent about its other business relationships. Let’s face it, consumers are sufficiently attuned to the business of brand extension to realise that Planet Ark must be contracting other organisations to manufacture, package and distribute its consumer products. Planet Ark "green" shopping bags, for example, are manufactured in China, and the organisation seems quite open about this. We don’t actually believe – or expect – that Planet Ark founders and front people like Jon Dee, Pat Cash and Rebecca Gilling are out in a back room somewhere with their sleeves rolled up, mixing up batches of detergent in plastic rubbish bins. And surely no consumer would think the less of Planet Ark for contracting another organisation to make and distribute laundry detergent and other consumer products under its brand name, so long as the ingredients and processes are specified and controlled by Planet Ark and are in keeping with its values and not-for-profit status. Do consumers really care who makes products, how and where? Traditionally, and for so-called "low involvement" categories, the answer was mainly "no". But recent trends in fast-moving consumer goods marketing have turned that around, especially among some significant customer segments. We are now encouraged – indeed, trained – to look for information and read the fine print: Is it made in Australia? Is it dolphin-friendly? Is it low GI and organic? Does it contain CFCs, artificial sweeteners, colours and flavours? Does it contain gluten or traces of nuts? Ironically, it’s the very fact that Planet Ark provides so much product detail on its washing powder pack that makes the absence of manufacturing information stand out so starkly for me. But am I just overly suspicious and is the lack of disclosure merely an oversight? Or – behind the hundreds of words on biodegradability, zeolite minerals and being free of phosphates – is there something about the washing powder that Planet Ark would rather we didn’t know? Update: Planet Ark comes clean!